Most fruits contain no fat or very small amounts of fats. No fruits contain cholesterol, and even fat-containing fruits fit into a healthy diet. You should try to get at least nine servings, or about 4½ cups, of fruits and vegetables every day, according to the Harvard School of Public Health. 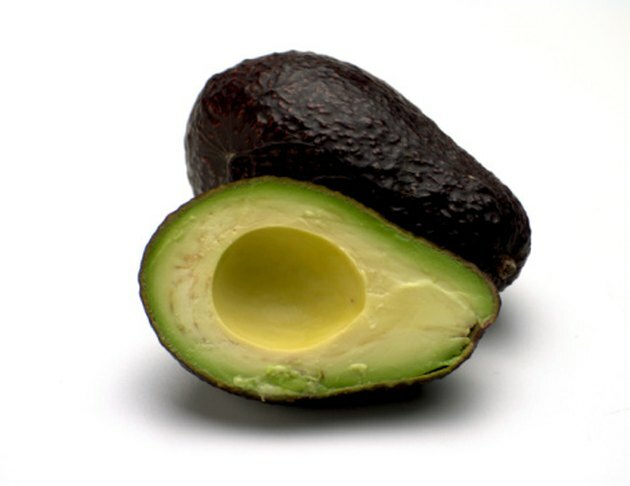 The avocado stands out among fruits for its low carbohydrate and sugar content and its higher fat content. A ½-cup serving of cubed avocado contains 120 calories, including 100 calories from fat. This serving contains 11 g of fat, including only 1.5 g of saturated fat. Unsaturated fats like those found in avocados should account for most of your fat intake. A ½-cup serving of cubed avocado contains only 6 g of carbohydrates, including 5 g of dietary fiber and no sugar. Dietary fiber provides a feeling of fullness with fewer calories and plays an essential role in healthy digestion. This serving of avocado also provides 1 g of protein, 10 percent of your recommended daily vitamin C intake and 2 percent of your recommended daily iron and vitamin A intake. The passion fruit, a dark purple tropical fruit similar to a pomegranate, contains 110 calories per 118 g serving, including 5 calories from fat. This fruit contains only 1 g of fat and no saturated fat. Passion fruit provides an excellent source of dietary fiber. A single serving contains 28 g of carbohydrates, including 12 g of dietary fiber and 13 g of sugar. This serving also provides 30 percent of your recommended daily vitamin A intake, 60 percent of your daily vitamin C intake and 10 percent of your daily iron intake. A serving of two medium kiwifruit contains 90 calories, including 10 calories from fat. This serving contains only 1 g of fat, and no saturated fat. Kiwifruit provides an excellent source of potassium, with 450 mg per serving, and vitamin C, with 240 percent of your recommended daily intake per serving. A serving of kiwifruit has 20 g of carbohydrates, including 4 g of dietary fiber and 13 g of sugar. Diets rich in fruits and vegetables can lower your blood pressure, improve digestion, help you control your blood sugar and appetite, and reduce your risk of heart attack, stroke and some cancers, according to the Harvard School of Public Health. Sufficient fruit intake also helps to maintain healthy vision and prevent cataracts and macular degeneration. What Fruits Should You Eat at Night to Lose Weight? Why Eat So Much Fruit If it Has More Sugar Than Chocolate?